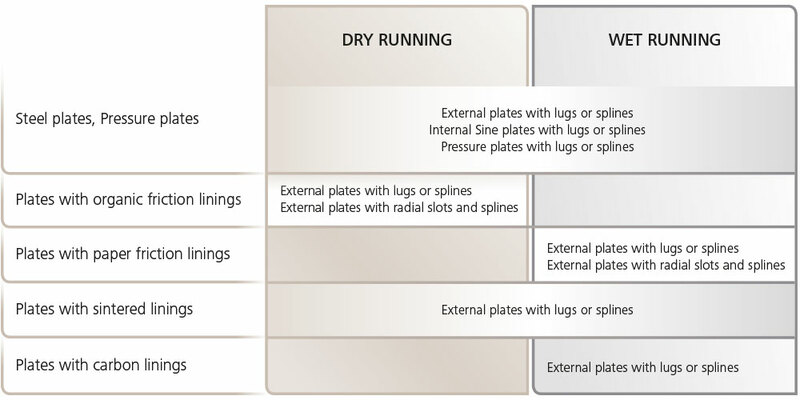 Plates for dry- and wet-running clutches and brakes by industries. Plates Dimension- and Torque range in Press technology. Plates Dimension- and Torque range in Marine technology. Plates Dimension- and Torque range in Construction technology. Plates Dimension- and Torque range in Agriculture technology. 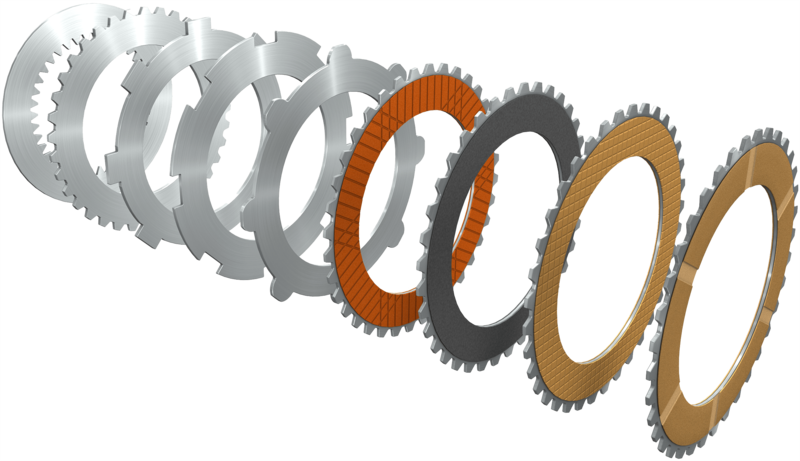 In the case of a dry-running application, it is primarily the level of wear, coefficient of friction, and noise that are influenced by the surface. Normally, a pair of plates consisting of "organic" friction lining on one plate and a counterplate of steel or special cast iron on the other are used. Sintered, metallic friction linings are also used for particular applications. When considering "wet-running" plates, it is necessary to consider the lubricating and cooling oil, since this plays a decisive roll in the frictional process. In wet-running clutches and brakes the "classical" friction combination of steel/steel is today being replaced more and more by steel/sintered coating. 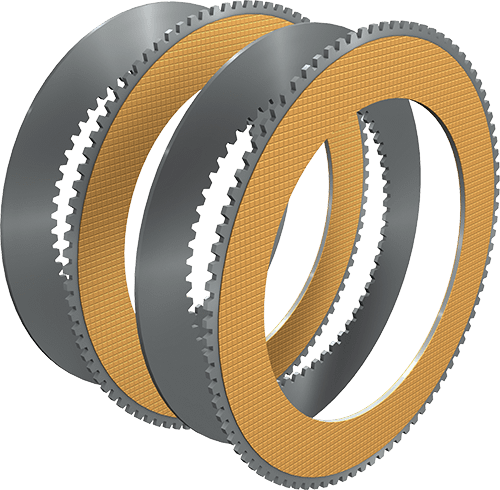 The standard qualities of sintered coating are able to cover a wide range of conditions which are placed on high performance friction linings. In addition, the sinter is capable of being varied in terms of composition porosity and compatibility with oil enabling it to fulfill a wide range of special tasks. Of special interest within the range of wet- running plates is the friction combination steel/paper lining. This is being used to an ever greater extent in transmission systems in general mechanical engineering and in the motor vehicle industry. This is due to its extraordinary frictional behaviour and its almost total freedom from wear.